These are hectic times for the Chinese embassy in Portland Place, which lies just south of Regent's Park in London. China's president, Xi Jinping, arrives on Monday for his state visit, and the embassy's staff are working round the clock, hammering out the last details of the trip. 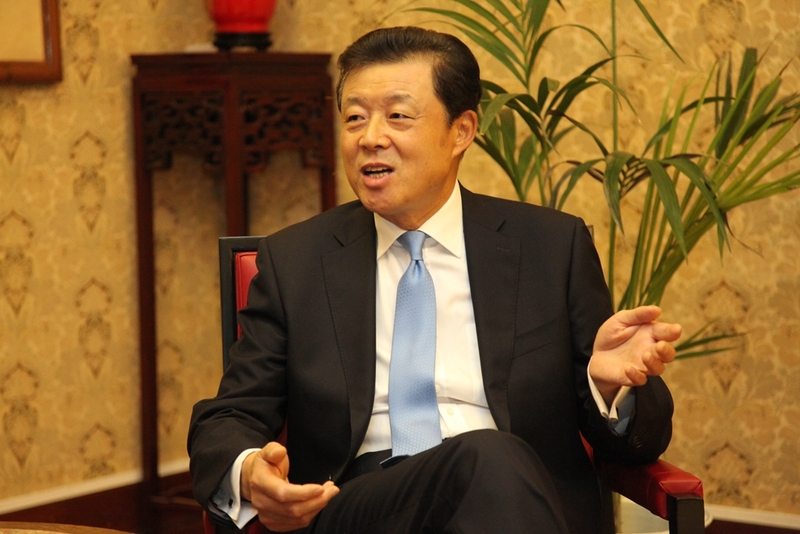 Liu Xiaoming, who has been China's ambassador in London since 2009, is an urbane, US-educated career diplomat; if he is fazed by the imminent state visit he certainly doesn't show it. An increasingly familiar face on TV news programmes, he is keen to highlight the growing ties between the UK and China. 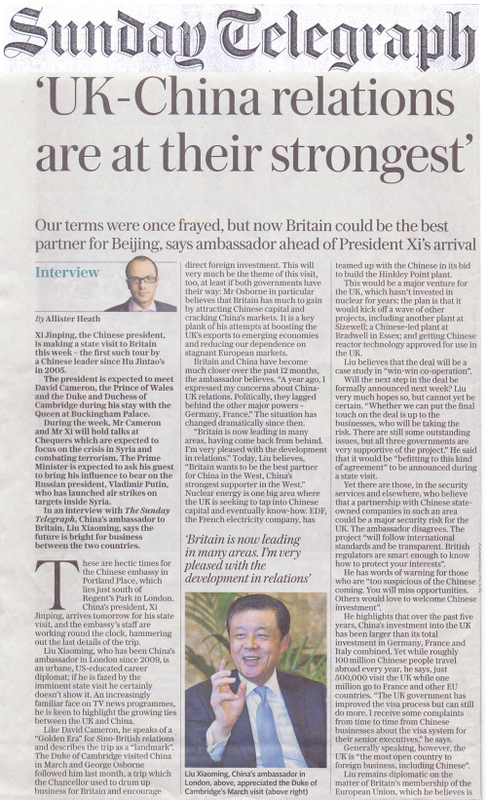 Like David Cameron, he speaks of a "Golden Era" for Sino-British relations and describes the trip as a "landmark". The Duke of Cambridge visited China in March and George Osborne followed him last month, a trip which the Chancellor used to drum up business for Britain and encourage direct foreign investment. This will very much be the theme of this visit, too, at least if both governments have their way: Mr Osborne in particular believes that Britain has much to gain by attracting Chinese capital and cracking China's markets. It is a key plank of his attempts at boosting the UK's exports to emerging economies and reducing our dependence on stagnant European markets. 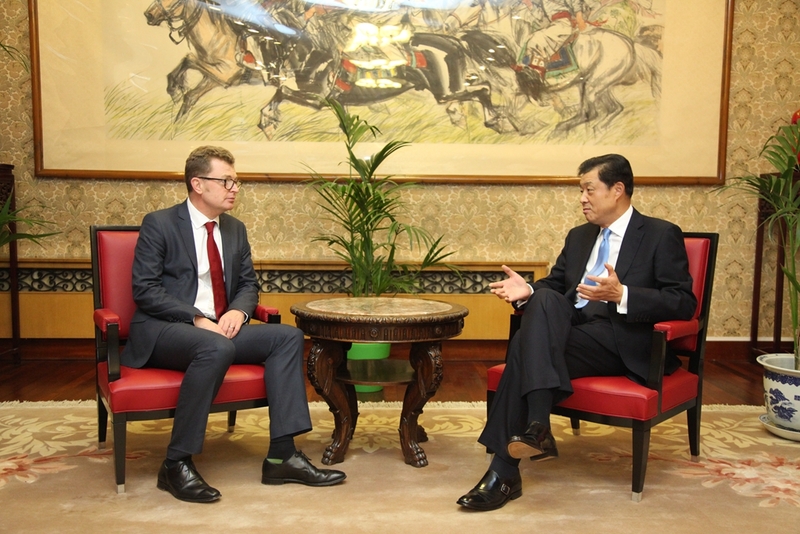 Britain and China have become much closer over the past 12 months, the ambassador believes. "A year ago, I expressed my concerns about China-UK relations. Politically, they lagged behind the other major powers – Germany, France." The situation has changed dramatically since then. "Britain is now leading in many areas, having come back from behind. I'm very pleased with the development in relations." Today, Liu believes, "Britain wants to be the best partner for China in the West, China's strongest supporter in the West." Nuclear energy is one big area where the UK is seeking to tap into Chinese capital and eventually know-how. EDF, the French electricity company, has teamed up with the Chinese in its bid to build the Hinkley Point plant. This would be a major venture for the UK, which hasn't invested in nuclear for years; the plan is that it would kick off a wave of other projects, including another plant at Sizewell; a Chinese-led plant at Bradwell in Essex; and getting Chinese reactor technology approved for use in the UK. Liu believes that the deal will be a case study in "win-win co-operation". Will the next step in the deal be formally announced next week? Liu very much hopes so, but cannot yet be certain. "Whether we can put the final touch on the deal is up to the businesses, who will be taking the risk. There are still some outstanding issues, but all three governments are very supportive of the project." He said that it would be "befitting to this kind of agreement" to be announced during a state visit. Yet there are those, in the security services and elsewhere, who believe that a partnership with Chinese state-owned companies in such an area could be a major security risk for the UK. The ambassador disagrees. The project "will follow international standards and be transparent. British regulators are smart enough to know how to protect your interests". He has words of warning for those who are "too suspicious of the Chinese coming. You will miss opportunities. Others would love to welcome Chinese investment". He highlights that over the past five years, China's investment into the UK has been larger than its total investment in Germany, France and Italy combined. Yet while roughly 100 million Chinese people travel abroad every year, he says, just 500,000 visit the UK while one million go to France and other EU countries. "The UK government has improved the visa process but can still do more. I receive some complaints from time to time from Chinese businesses about the visa system for their senior executives," he says. Generally speaking, however, the UK is "the most open country to foreign business, including Chinese". Liu remains diplomatic on the matter of Britain's membership of the European Union, which he believes is "the UK's business". "China would like to see a strong Europe because we believe in a multi-polar system," he says. The region also matters greatly economically to China: "Europe altogether is a bigger trading partner with China than the US." Yet while he would like Europe to do well, "when it comes to the specific relationship between the UK and Europe, that's up to the UK to negotiate," he says. "The best thing for us [China] to do is to sit back and watch. We have to accept the outcome." Those Chinese businesses that deal with the UK's domestic market won't be affected, he says; those that use Britain as a springboard to the continent may be. "But I think people have to adjust their business to new challenges, new situations." China wants to have a strong relationship with the EU – but it also wants to develop bilateral relations with the individual European nations, he says. He hopes China and the EU will conclude a Free Trade Agreement in the not-too-distant future. And he appreciated that Britain wants to take the lead in that process. He wished other European countries would be as open to China as Britain. As to China's recent economic problems, including intense volatility in the stock market and a sharp reduction in growth, Liu isn't excessively concerned. The slowdown is "healthy", he says. He still believes that China will double its GDP between 2010 and 2020 despite intense competition from neighbouring countries with lower labour costs; the aspirational "Chinese dream" remains on track, he insists. He believes that GDP growth was 7pc during the first half of the year; to make growth sustainable after a 30-year boom, China is having to reduce energy-intensiveness, boost consumption and cut capital spending as a share of GDP, he adds. "The Chinese stock market isn't mature yet. It will take some time for small and medium-sized investors to make sense of how things work, to be reasonable and not to gamble with the market," he argues. For Liu, President Xi exemplifies the difference between the Western and Chinese political systems. "The president is really from the grassroots," Liu says, pointing to the fact that he started right at the bottom of the Communist Party's hierarchy, slowly and methodically making it all the way to the top, from lowly communes all the way to the central government, serving at the county, city, district and province level. By contrast, some Western politicians can become "overnight stars", the ambassador says. Jeremy Corbyn, the Labour leader, has said that he would raise the issue of human rights with the president. As Leader of the Opposition, Corbyn will be granted 20 to 30 minutes with Xi; though as Liu points out, British politics is far more complex than it once was. "It is difficult to define what is the opposition as there are now more parties," he jokes. It turns out that Corbyn met the ambassador for the first time earlier this week. "I think it was a good meeting," he says, congratulating the Labour leader on his knowledge of the Chinese communist party. As to next week, "the president and Mr Corbyn can discuss any subject of their mutual interest. But the important thing is that there isn't much time, and I hope they will focus on co-operation. We don't shy away from discussing human rights," Liu says. He is keen to highlight how China's remarkable economic growth has transformed ordinary folk's lives. "We have elevated 600 million people out of poverty. This should be regarded as the big contribution that China has made to human rights." But as is so often the case these days, the real decision on this trip was about football. Which club would Xi, leader of an increasingly football-mad country, choose to visit? There were even rumours that the president's visit could precipitate Chinese investment in another club. The Chinese, in the end, have gone for Manchester City. Xi, himself a football fan, will visit the grounds and the football academy where Man City trains its young talent. But in the interests of fairness, some Manchester United representatives might also attend. As carefully balanced diplomatic decisions go, this one will take some beating.